The following is an excerpt from a letter to J. Gregory Payne from Florence Schroeder, the mother of Bill Schroeder, killed at Kent State on May 4, 1970.
. . . 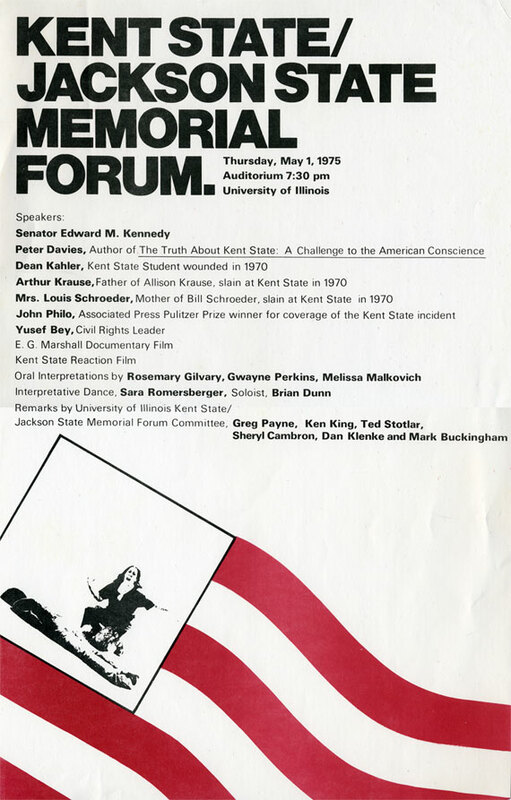 When the Kent State families first realized that there was a possibility of a settlement without the second trial, there were many heated discussions of the matter. The lawyers agreed among themselves that they would not discuss their personal preferences, and would not try to influence us in any way. Some of the families felt that we were passing up a chance to "showcase" the event again, and that the media exposure was invaluable. On the other hand, some, including ourselves, felt that there was nothing new to be learned, and that we had little chance of any financial settlement, even with a favorable verdict. The lawyers were well prepared and we never lost confidence in their ability to present a winning case. BUT, there remained the physical condition of Dean Kahler and Joseph Lewis, and possibly others, who would need the financial settlement to help establish useful lives. So, the money was passed out, and the Guardsmen crossed their fingers while they signed the "statement", and the families held their "final" press conference. However, with the advent of the NBC movie, the "showcase" has been reinstated, and more people than ever will be given the opportunity to see a graphic exposure of the events of May 4, 1970. I still find it hard to believe that the movie is a reality. It is an answer to a prayer, and I hope that it will reunite the Kent State families. Far be it from me to try to advise other parents. I have made more mistakes than I care to remember, and am reminded of them every day of my life. But one thing shows up more than any other, and that is my failure to listen, and to carefully consider all of the facets of a situation before I passed judgment. This is as important for a young adult as it is to a child. Our children can only react to life's situations as they have been trained to think before they react. I do not feel guilty, and do not feel that I contributed to Bill's death in any way. I am proud that he made the decision to be a part of the activity that day, and that he did not hide his true feelings about war in Viet Nam. If Bill was right to be where he was, then who was responsible for his death? Where did the Guardsmen get the idea that they could shoot and get away with it? Somewhere, I have heard the expression "Military Mentality". Does it start with the Pentagon, go to the White House and to the State house, to the Adjutant General and filter down to the officers and enlisted men of the Ohio National Guard? Since their counterparts in Viet Nam were permitted to kill indiscriminately, why couldn't they? Just as the invasion of Cambodia sparked the student demonstrations, didn't the "military mentality" invade the minds of the part-time soldiers? For me, the blame goes all the way back to the beginning. The Pentagon did not enforce the Army rules and regulations for the National Guard, and the President considered the students "bums", and the Governor was seeking political acclaim. The individuals who actually did the killing will have to live with their consciences for the rest of their lives. Except for a very few individual experiences, I am only aware of a general change in attitude regarding responsibility for the deaths and injuries at Kent. As the general public has become aware that our involvement in Viet Nam was not in the best interest of this country, or even in the best interest of Viet Nam, there has been a corresponding realization that the students were right in the first place. If we, as adults and as citizens of the USA, had listened instead of reacting with the above-mentioned "military mentality", many lives would have been saved, in Viet Nam as well as at Kent State University. That is also the significance of "Kent" to America. I think that the powers-that be have realized that all segments of the citizenry are entitled to an opinion and that this opinion must be "reckoned with". We must "reckon" with this when we vote, when we gather at a house of worship, and in our social and service organizations. Political action must be humanized. In spite of the heart-breaking death of our son, who we loved and still love dearly, our live are still enriched by his having existed. His life is reflected in the rainbows in the morning and evening stars, in the butterflies and the flowers, and all of the beauty of the earth. I know that heaven has meant an access to all Truth for him. He was always so eager to learn, and he pressed more into his short lifetime than many others do in a four-score life. He would have contributed so much to the quality of life in this great country. I pray that his death served as a cornerstone for a "new morality". Thank you for giving me the opportunity to write this. It will probably not be very useful to you and the book. At the press conference after the settlement on January 4, 1979, I said that I would never cry in public again. I am crying now, in private, but it has all been a catharsis, an I can celebrate Thanksgiving Day with my family tomorrow, knowing that I have done by best to confront the circumstances that were thrust upon me on May 4, 1970. There's nothing better that a dead destructive, riot making communist, and that's what your son was, if not he would have stayed away like a good American would do. Now you know what a goody-goody son you had. They should all be shot, then we'd have a better U.S.A. to live in. Be thankful he is gone, Just another communist. I heard you on T.V. and if I were a policeman I would kill a lot more of these kids. Keep your kids home then they do not get in trouble. My boys and girls do not get in trouble. Sure looks bad for you parents. Kids belong in Your home, entertain them in your home like we still do here. hope the police and Army kill a lot more kids. It has to be stopped now as it is getting so you can not go out on the street. We do not feel sorry for none of you parents. Keep your kids at home. The biography of their son was written by Mr. and Mrs. Louis Schroeder to aide lawyers in the civil cases. Our son was born in Cincinnati, Ohio, while his father was employed by the Trail mobile Corporation, and the family lived in the suburb of Dillonvale, a new development near Deer Park, Ohio. He was born strong, in mind and body, his thirst for knowledge, and his desire to make this country a better place to live were the keystones of his life. His first childhood idol was Tonto, the Indian friend of the Lone Ranger. At the age of three, Billy knew that the "good guys" were on the right side, and that law and order were an important part of the growth of our country. But the Indian heritage was also important. this fondness for Indian lore of both Billy and his brother and sister led the family on year-round tours of museums and parks. His favorite historical site was Fort Ancient, near Lebanon, Ohio. While following a marked Indian trail there, he searched in the hillside rock strata and made an original "find" of an arrowhead. Its authenticity was verified by the museum officials, and it was always one of his most precious possessions. Soon after that, he purchased his first geologist's pick and spent many holidays in the search for fossils, rock samples, and artifacts of historical value. It was also the beginning of his rock collecting days, a hobby which led to his desire to study geology. Since the study of Indian lore is so involved with the history of our country, Bill's first reading for pleasure was naturally in the field of social studies. His first subject of intense study was General Custer, and this was followed by studies of all of the Indian Wars, and then the Civil War, World War I, World War II, the Korean conflict, and finally, Vietnam. He was concerned with the causes and effects of the wars, as well as with the dates and places and people involved. Perhaps it was his habit of getting emotionally involved with the causes of wars which led to his application for the Army R.O.T.C. Scholarship. He abhorred the destruction of property and the loss of life which necessarily accompanies war, and for this reason, he wanted to complete at least part of his education before he was called to military service. In 1969, while still only 17 years old, he signed away 10 years of his life - four in college, four on active duty, and two more in the Army reserve. No one can accuse him of attempting to avoid military service. His conscientious attention to the military phase of his education is evidenced by the fact that he received the Academic Achievement award from both the Colorado School of Mines and from Kent State University. For most grading periods he was first in his military class. He also earned the Association of the United States Army award for excellence in history. "Every one of the boys Bill had in his patrol when he was a Patrol Leader-and this was five years ago-everyone of those boys came to the funeral parlor. As a leader of boys, he was demanding. He expected them to meet his own standards. The last time I saw Bill was in March when he came home for a weekend and was camping with the troop out at Firelands Boy Scout Camp, and we had a long talk about college and what he stood for and what he wanted . . ."
"At 6 feet, 2 inches, he often played against taller opponents, but he made up for it with determination. He was a highly dedicated athlete." Since Bill was really only 6'0" tall, the accomplishment was an even greater triumph. "This boy had lots of interests, lots of curiosity. He was interested in learning. The first thought that entered my mind was that he was down there trying to get them to behave themselves....appealing to the demonstrators' better judgment....not stirring up trouble." "I had Bill in the 11th Grade Honors English, and found him to be an excellent student. His intelligence, his perceptiveness, his leadership in the classroom, and his amiability made him one of the best student I have had the pleasure of teaching. What other words of praise do you give to someone you liked so much?" Bill had other interests in High school. He was a member of the Future Teachers of america, the American Field Service and the National Honor Society. He was also a Teacher's Aide. During his Senior year, he was fortunate to be the aide of Mr. Thurmond Riddle who teached U.S. History and Problems of Democracy. Mr. Riddle had been one of Bill's favoirte teachers and a person for whom he had great personal respect. On the day of Bill's funeral, Mr. Riddle talked to me about the child which he and his wife were expecting within a few days. I could not have been more proud than when I heard him say if the child were to be a boy, he would want him to be exactly like William Schroeder in all ways. More than 12,000 high school boys in the United States applied for the 900 United States Army R.O.T.C. Four Year Scholarships which were granted in 1968. The recipients are permitted to attend the colleges of their choice, and Bill chose to attend the Colorado School of Mines, Golden Colorado, because he had been told that it was the best place to study geology. However, after the start of his first semester there, the school policy was changed, and they no longer offered a major in Geology. He would have been required to study Geological Engineering, with emphasis on mining. Also, the minor in Psychology would have been impossible, due to a cutback in the Humanities courses available. So he decided to transfer to Kent State University, and to change his course of study to a major in Psychology. While at Colorado School of Mines, he was named to the Academic Honor Roll with a 3.1 average, played Intramural Basketball, was in the R.O. T.C Band, and was a member of the Counter Insurgency Unit training Group. April 21, 1970 . . . . . . .
"Now that I am free all of the time, I am reading, walking, and generally having the real fun of being creative. I was loaned a $200.0 camera and all the film I can possibly ever use. Bruce and I take photography excursions and he is teaching me the ropes. (Bruce is a cinematography major.) I go to all the free lectures, concerts, or bull sessions on campus. I'm finally getting some semblance of an education . . ."
Bill came home for the weekend just one week before the violence started. He had just completed his first experimental research project, and had submitted his typed report. After his death, Mr. Robert Fermie, Assistant Professor of Psychology, returned the report to us with the grade of A+ and this notation - "You seem to have a good feeling for the scientific style of writing." Bills life was full, but not full enough to suit him. He loved to travel, and while the family trips were always short, one day trips, he wanted to see more of the United States. At the end of the summer before he left for Colorado, he and his brother drove to Florida to visit their aunt for a week. He came home for the Thanksgiving and the Christmas vacations, but when he was sure that he would study in Ohio the next year, he decided to see more of the West before he came back east. During the Semester break, a group from the dormitory visited the Grand Canyon and other scenic spots in Colorado, Arizona and New Mexico. He then looked ahead to the Easter exchange of "bulletin board" advertisements. His three traveling companions were a 36 year old former Brazilian missionary (Mennonite), married liberal thinker and a very gifted person. The other two men were 20 and 21 years old, and were both Conscientious Objectors doing service in the medical ward of an Army hospital. Bill wrote, "We got along quite well, and it was really fun to be with these people." They were permitted to build a lean-to and sleep on the beach, as did many other tourists, and it was all very quiet. They toured the surrounding area and cities and reported that the majority of the people live in dire poverty. Bill was especially worried about the plight of the children. Bill's last trip was also the most exciting. He and his Kent roommate drove to Florida for the Christmas, 1969, holidays. After visiting relatives for a few days, they went to Miami and were asked to work on the preparation for the Miami Rock Festival. After helping to "clear the area of rocks and trees", they were disturbed by the habits of the "flower children" who were congregating there, and by the attitude of the local police who interrupted their sleep on the beach with a flashlight and a "we don't want your kind here." So, after two days, they decided to come back home and spend the rest of the vacation with family and friends. They really were not "That Kind". Even if Bill had not done so many things of which we could be so proud, it would have been a blessing to have him for a son. He was always "all boy", and was as mischievous and naughty as the average boy, at times. He was always honest, both with himself and with others. He knew that he had to suffer the consequences of his acts. We taught him to think for himself, and that he should not follow the crowd blindly. He was independent, and always had a logical explanation for what he did or thought, or admitted that he had made an error in judgment. He lived to learn, and wanted to share what he learned. He was often a volunteer dish dryer, but only when we could talk about what we had each learned that day. For the past year, his reading for pleasure ranged form Freud to Ray Bradbury, in addition to the non-fiction history writings. The last time that he was at home, he asked for books about Albert Schweitzer, and announced that Dr. Schweitzer was his new "hero". Bill had many friends, young and old, rich and poor, black and white, near and far, and all ranges of intelligence. Each facet of his life was involved with a different group of people. during his dating years, he enjoyed the "friendship" of many girls, but said there was plenty of time before he would attempt a lasting relationship. Long after he stopped dating a certain girl, he would still stop by for chats with the girl's parents. He seemed to have the ability to discuss current events and topical situations with adults as well as with those his own age. He did not every stop playing basketball, and had a special group of friends for that. The home-town college crowd (over 18) had a favorite place to stop for a beer and a lot of conversation. there was also a group that met at the pool hall or the bowling alley for a bull session. It was a way to relax. And then there was the group that came to the house for pizza and to hear his "Rolling stones" records. The music was too loud, but a welcome sound to us. One of the high school teachers told me that he thought that Bill could have succeeded in any career which he might have chosen. This is probably true. What he needed was the experience of living and associating with people. Then he would have put it all together, and would have been a writer. He said once that he wished that he could travel for one day and see the sight through the eyes of James Michener, or with the insight of Ernest Hemingway; but Bill would have ended up doing it his own way. He always new what he wanted and where we wanted to go. It was just the path with was not yet clear. He was trying. He wrote the following poem to me for Mother's Day, 1969. "Here it is, my twenty minute special. One of these days I'll concentrate and take my time, and win a Pulitzer Prize". For a mother's sorrows and fears. What you felt was needed regulation. Ignoring the most sincere supplication. Despite the most reverent of prayers. From my previous conflicts and errors. For a mother who was so deserving. The thought of the future dominates any other. If you'll stay just the same as my mother. You can't perceive all the pleasure in my smile. It's lot of fun to have you there.